This weeks Bloggers Challenge is Red, White and Blue. 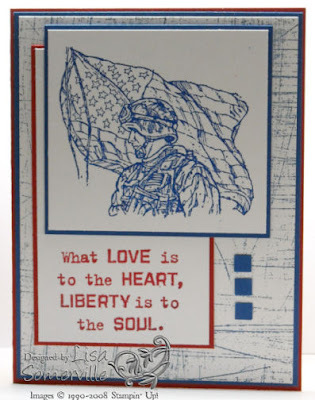 I made a second card..that doesn't stay within the color challenge but....I wanted to share it because it is fitting for the Memorial Day Holiday. At this time of year there are always planter boxes with red, white and blue flowers, and I thought I could do that with my Bloomin' Beautiful set...well, I just had to add some green and caramel to the card - it needed green leaves! 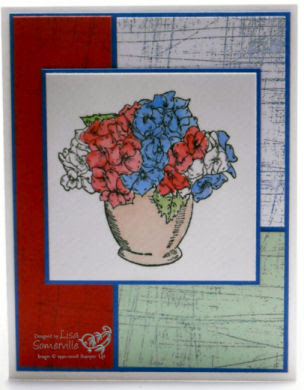 The Color Blocking Technique works great for color challenges...Here I stamp my Bloomin' Beautiful image on watercolor paper, then colored my flowers in real red, brilliant blue and white stazon. The background is stamped with the Sanded stamp in Brilliant Blue. I might just have another sample to share later on today...if not, I'll share it over the weekend. If you'd like to play along, leave a link to your creations on this post, or if you upload to SCS please use keyword BC48, so I can find your post. Wow Lisa...two fabulous cards. Your military card is my favorite of the two. I don't have any military stamps and am always impressed with how much they stir my patriotism. Both cards are really great. BTW...love you new banner! Both cards are great! I love that you left the white without the sponging. Really stands out. And of course the other one is Blooming Beautiful! Have a great holiday weekend. Great job on BOTH your cards, Lisa! I was hoping you would use this set again - great cards Lisa, but I love the first one. Our friend Greg is in Iraq right now - this just reminds me of his and all our soldier's service for us. Beautiful! I love the patriotic one and the color blocking with the Bloomin' Beautiful with the different colors. TFS! Great on both cards!!! don't you just love that sanded background...it is so versatile! i love how you have used it here with two totally different themes, so to say. Both cards are fantastic! I love the hydrangeas! They are both FABULOUS Lisa - I love that first one and how patriotic it is but I agree with you, I think the flowers card is perfect for this weekend! I am glad you did not sponge the white, it makes it pop! Both cards are great! Have a super weekend! Great job, 2 very different cards! What beautiful cards...I love them..
Great job on both cards. The Bloomin' Beautiful is perfect for the "patriotic" flowers. Beautiful cards, Lisa! I love your idea with the r,w & b flowers -- they'll be all over our town for the parade this weekend! These are both great! I really like the look of the Sanded background against the white--so striking. Nice job on both your cards. I love the simplicity of your first card. How you didn't color in your image but let it speak for itself. On your second card it was fun to see the color scheme altered just a little along with your wonderful red, white & blue floral arrangment. Super duper cards Lisa! The first made my heart stir...the 2nd made me smile...how clever you are! Both cards are just fabulous! I especially love the choice of background on them! The color blocking is cool and the soldier all in blue is striking! Lisa, these both turned out beautifully. I especially love what you did with the military stamps. Both cards are wonderful! AND so patriotic!! The first is truly in keeping with the holiday and the floral one reminds me of all the potted pansies around here....they are red, white, and blue and, of course, a small flag is included. They are beautiful...and so is your card! Lisa, you are amazing. I love what you did with the Blooming Beautiful set. It's beautiful & so creative. The patriotic card is lovely as well, but you really blew me away with the flowers!! awesome!! Both are fantastic cards Lisa! I love the flowers - it does remind me of the flower pots that I see all over town.